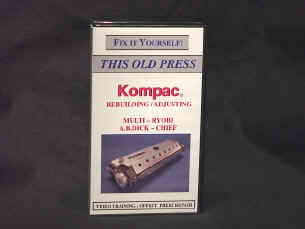 This Old Press "Kompac" is an easy to understand video training tape that shows you how to rebuild ANY! Kompac unit. Dr. Don shows how all Kompacs work, and rebuilds one, step by step, then shows the special set-up techniques that only your service technician could make before. No matter what model Kompac you have, THIS video is all you need to rebuild and adjust the Kompac units.